The Culver Crest is a neighborhood in Culver City, California. It is bordered on the south by the Beverlywood West condominiums, located at Sawtelle Boulevard and Overland Avenue, by West Los Angeles College on the north, by Overland Avenue on the west, and by the Holy Cross Cemetery and the Baldwin Hills on the east/southeast. On the corner of Sawtelle and Overland there is a public elementary school named El Rincon. Blanco Park, which is attached to the school, is open to the public during non-school hours. Culver Crest immortalized a part of developer Lewis Crank's life, with streets named for his boat the Esterina, which had been named for his first wife Esther (Anthony Cornero's sister); Linda Way for his eldest daughter; Cranks Road, and Ranch Road as the property had been an avocado ranch among other things during Prohibition. Lugo Way was named for Charles Reyes Lugo, a descendant of early settlers, and police captain. Stephon Terrace was named for 1930s Councilman and Police Commissioner, Phillip Stephon. Tellefson Road was named for a city official, Mike Tellefson. Stubbs Lane, a private road, leads to former City Clerk Helene Stubbs' home. Youngworth Road was named for the early developer, whose home (and former home of Mr. Crank) is still on the Marycrest Manor property. In the 1950s Baldwin Hills and Crank Annexation #1 become the Culver Crest. Mr. Crank later subdivided his property into lots. 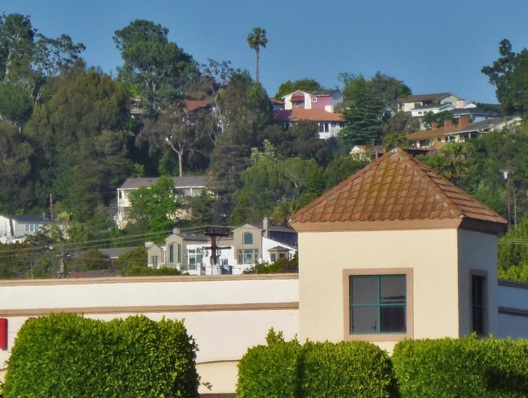 The Culver Crest neighborhood of Culver City is a hillside neighborhood east of Overland into the hills just south of West LA College. Many of the homes enjoy a western view with very little traffic and nearly 20 small streets. The neighborhood has approximately 275 homes with many over $1 million dollars as of 2010. At the very top of Culver Crest is Marycrest Manor which is a large property owed by the Catholic Church and serves as a retirement home for nuns and clergy.